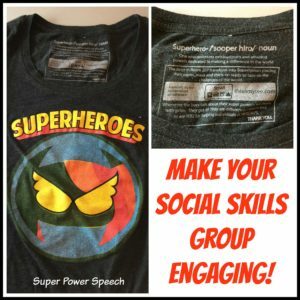 Last year, my special education teacher and myself ended up running 3 different social skills groups. They were separated by grade level for scheduling reasons, and each had five students. That’s fifteen social skills students on IEPs in an elementary school! We met on Fridays in the special education classroom. 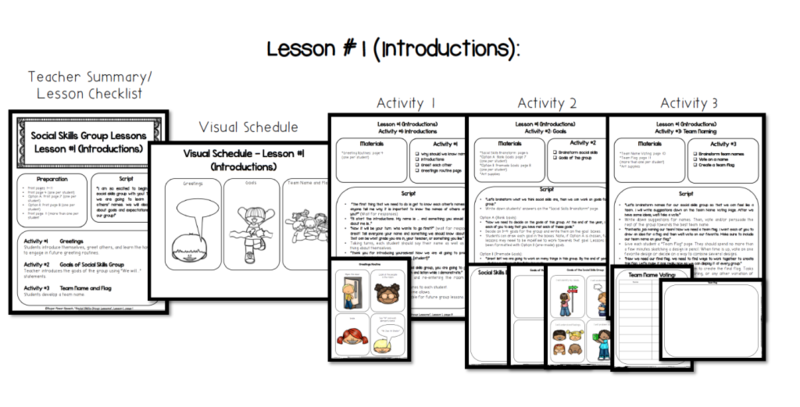 I provided the materials and lesson plan. Although one entire group was fifth graders and they are moving onto middle school, we recently found out that we will have just as many kids replacing them. 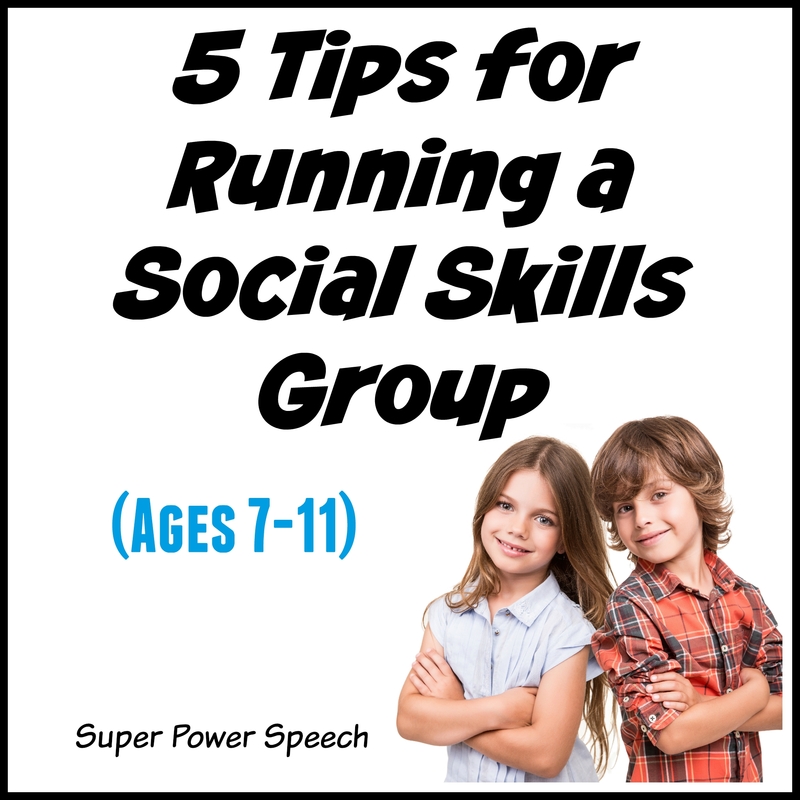 So, in addition to 5 Tips for Running a Social Skills Group (for kids 4-7), I need to get ready for this year by coming up with tips for working with older elementary students. 1. Encourage students to be a team. 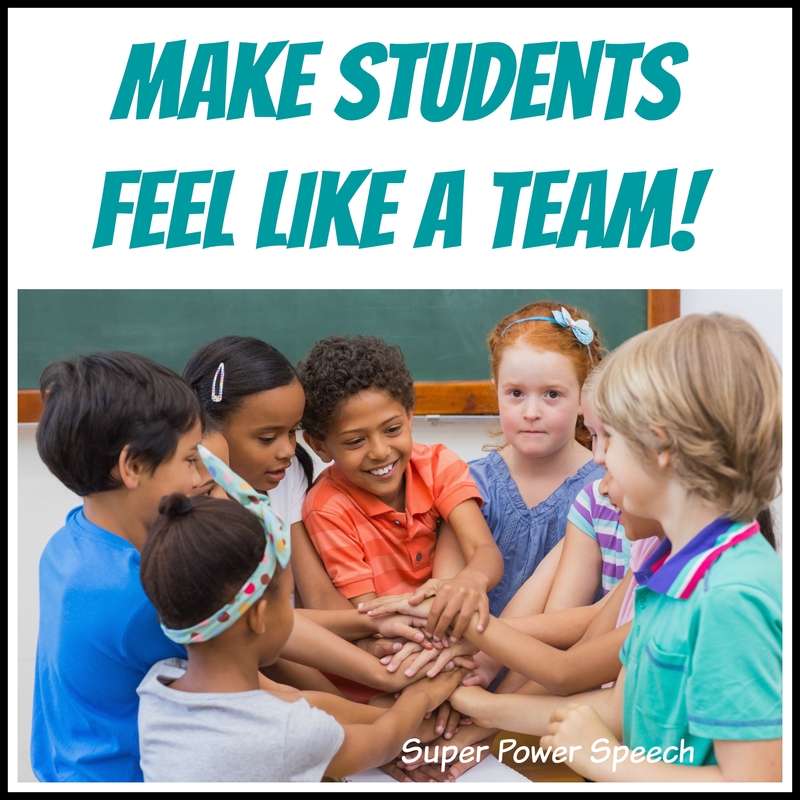 Students can feel like a team if they are encouraged. They can develop a team name, team picture, or team flag. Trust and friendship will help them both inside and outside of the social skills group. 2. 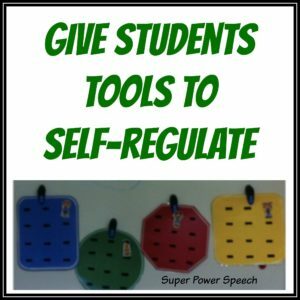 Engage students with fun materials. 3. Give students tools to self-regulate. 4. Practice, Repeat, Practice, Repeat. According to a study by Lally (2009), it takes 66 repetitions for a typical learning adult to form a new habit (see article here or study abstract here). That means that if we want our students to form habits of automatically greeting, eye contact, or making small talk, they have to practice. A lot. 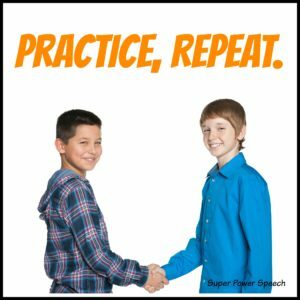 If your social skills group meets once per week for a school year, you still won’t have all 66 repetitions in for a habit to develop. Take opportunities outside of the social skills group to practice as well (in the classroom, in the hall, out at recess). 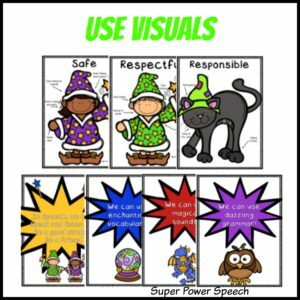 Yes, even older students need visuals. These do not need to be in the form of clip art. They can be written visuals, or (my favorite) photographs/videos! Taking pictures and videos of students engaged in a desired activity or feeling can be powerful for the student, the teacher, and others that see the image/firm (teachers, parents, etc.). Visuals are ideal for expectations, goals, schedule, or new skills. The image below shows the visuals that will be displayed in my classroom to emphasize the speech rules and goals for the year (these are available for purchase here). And… with all these tips in mind, I have created a full social skills curriculum for 7-11 year olds!!! It’s here at last! My new baby (product) has entered the world, and it is a BIG one. Over 300 pages, this one is intended to last at least a year for forming and improve social skills and self-regulation. Included in this product are 40 (yes FORTY) lessons designed to last 30-60 minutes each for students with language levels in the 2nd to 5th grade range. 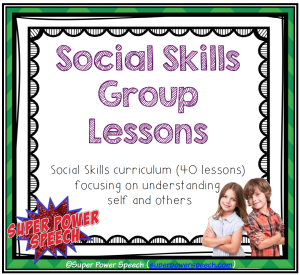 This social skills curriculum is designed to work on social skills and self-regulation skills. The age range intended for these lessons is students with language levels at the second to fifth grade level. 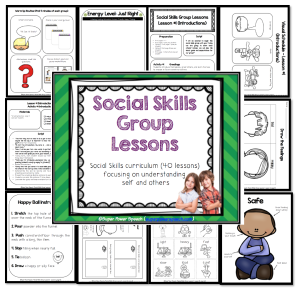 The lessons are intended for small groups of three plus students, although they can be adapted to work with an entire classroom. Each lesson contains three activities. Lessons are designed to take 30—60 minutes each, however, activities can be taken away or added to adjust the time. In addition, unfinished lessons can be continued onto the next session if needed. Lessons are in groups of five focusing on 2 opposing emotions. Screen the students at the beginning of the year to determine the most appropriate lessons to use. See the materials up close and personal in this video! You seriously do not want to miss out of this curriculum. It will make your life so much easier this year!! Click here or on the image below to purchase your copy! Wondering how to informally assess your students with social communication difficulties? 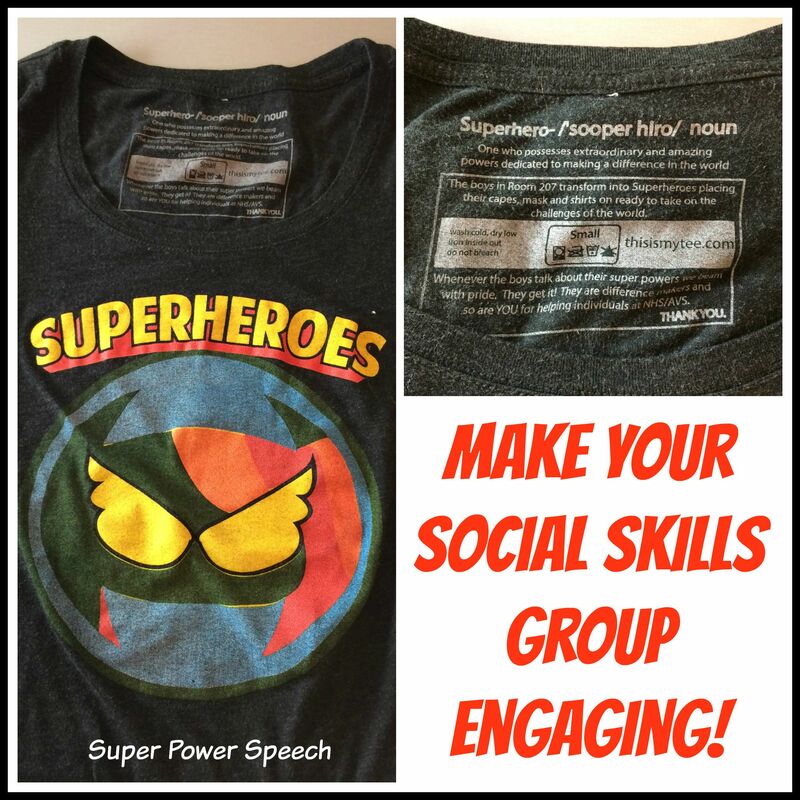 Check out my post about the Social Language Informal Assessment. I searched your TpT store, found it, got it and it looks fantastic! I can’t tell how sophisticated or simple the lessons are. For some of my 5th graders, working on sad/happy may be too low. However, perhaps the problem solving will be more challenging, but I couldn’t tell from your presentation. Could you elaborate a little more? Did you watch the video? It might give you the information that you are looking for. The happy/sad is the easiest and then it gets harder. There are 40 lessons so there is plenty to choose from. Please do you have the curriculum for preschool and kindergarten?